A look at the four new products that PeopleStrong announced in its annual product launch AltifyHR2019. Today’s work ecosystem bears hardly any similarity to that of a few decades ago. Call it a passage of time, a generational shift, or disruption, there is no denying that right from the process of sourcing candidates to the way the workforce communicates with each other, the change is drastic. In this fast-paced, globalized world, the ability of employees to connect, collaborate, and innovate will determine the ability of an organization to thrive and survive. It is no news that technological tools can help employees navigate the complexity of the modern workplace and help companies to enhance employee experience and improve productivity. However, according to Pankaj Bansal, Co-Founder and CEO of PeopleStrong, the new world of work needs products which are open to connect and integrate with other apps and can provide a unified view to the users, be it in the form of data or experience. Intelligent, connected and open devices—is the new code of work! In its Annual Product Launch Event AltifyHR2019, People Strong unveiled four new products: Alt Builder, Alt Analytics, Alt Messenger, and PeopleStrong Developer Community. 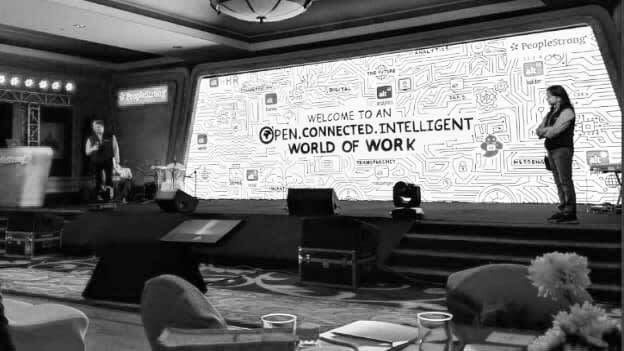 With an aim to removing the complexities and rigidities of the traditional enterprise technologies used at work, PeopleStrong stressed on the ‘Intelligent, Open and Connected” technologies to up your game in this new world of work. Despite investing in enterprise solutions, still, more than 20-25 percent of work is done manually. This challenge can be attributed to the lack of customization in the traditional ERP systems. Alt Builder, the first PaaS product for work tech, allows business users to create their apps on the go without having to depend on any developers. It enables the users to create an app from a drop and drag interface which requires no coding. One of the most interesting benefits of this technology is that businesses can connect their app with the entire HR database. While the use of dashboards and metrics has become conventional, for the most part, data analysis is still mostly backward-looking in the sense that the primary focus is on measuring historical performance rather than planning for the future. The Alt Analytics tool apart from offering the primary analysis like gender count, number of new hires, exit numbers, offers ‘predictive layer’ to the analysis. • The probability of the person joining your organization. • The number of back up offers, etc. • Which employees are likely to leave the organization? • Who are the top employees who can leave organizations, etc. WhatsApp is increasingly becoming a popular instrument for employee communication. However, a lot of time businesses feel skeptical about data privacy. PeopleStrong added another layer to its Alt Messenger - which can allow enterprise tool to get linked with WhatsApp. The messenger enables the teams to make a group within and outside (gig workers, consultants, etc.) the companies in a secure way. It further ensures that the data and information is not being shared outside the team. Moreover, it allows creating a group where one can track goals, achievements, acknowledge more quickly and effectively. Additionally, PeopleStrong also launched PeopleStrong Developers Community which will provide developers and partners to extend PeopleStrong's product capabilities as per their specific needs and can plug and play their apps. PeopleStrong celebrates its 13th anniversary this year, sharing the journey in numbers, the company said it had achieved: Over 50 integrations done, 1 Mn applicants, Over 40 talent solutions, more than 7 Lac users, 10 Mn transactions and 4 Bn of salary processing. PeopleStrong’s new HR technology is an excellent example of the “New World of HR Technology”, which will help employees stay productive, and engaged.